Started by a Scottish tea company in 1859, Glenburn then passed into the hands of one of India’s pioneering tea planting families – The Prakashes, One of India's pioneering tea-planting families, we have, over the years, come to be known as the “Chaiwala family“ - which literally means “tea planters “. The story of the Chaiwala family began over a hundred years ago, and is closely entwined with that of tea plantations in India. Today, the third and fourth generation Prakash family carry almost a century of tea knowledge in their inheritance, and we invite you to experience this legacy at Glenburn. The “tea estate” experience was inspired by the vineyards of Europe and other parts of the world, where visitors observe the wine-making process, taste the wine and shop for wine, local crafts and produce. We found the whole experience educational and very interesting, and were inspired to open our own tea estate for tourists who may be interested in knowing about how a tea leaf makes it to their tea cup. On her very first visit to Glenburn, Husna-Tara Prakash decided this was the spot for such an experience. It was simply the most heavenly place. In addition to the “tea experience” we could also offer the guests a “walking” experience, and Glenburn remains one of the few destinations in India where you can walk all day and return to luxury at night. We grow our own fresh herbs, spices and many fruit and vegetables, making the experience a “foodie” one as well, with an emphasis on using local ingredients to create mouth watering, unique menus. The initial idea took about a year to materialise. On a chance encounter, Bronwyn Latif – an interior designer based in Delhi - found herself at Glenburn and fell in love with the place, too. Before we knew it, we had fallen right into a complete restoration of the main bungalow of the estate. Our aim was to restore it to its original grandeur. Layers and layers of paint and plywood covered the beauty of the house, as if each manager’s wife wanted to contribute in some way to its splendour. We would not have got very far without Bronwyn's amazing energy and passion as far as restoration and innovative ideas go. In 2002 The Burra Bungalow was lovingly restored, whilst retaining the style of a colonial planters' bungalow. With 1000 acres of private forest, and two rivers running through the estate, is a wonderfully peaceful place to stay and offers a unique holiday experience. In 2008 we added 4 more rooms at Glenburn as part of The Water Lily Bungalow. 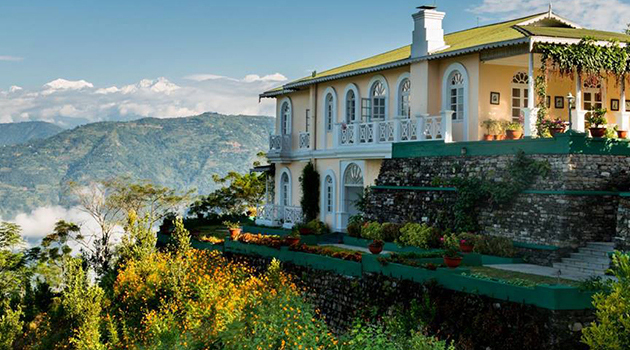 Perched on the edge of the hill in front of The Burra Bungalow, all rooms have stunning views, including Darjeeling Town up on one hill and, of course the Kanchenjunga Range straight ahead. We have sourced antique furniture for all the rooms, as well as some old Burma teak for the flooring. Restored old cast iron window frames with arched skylights shape the 9 foot high windows in each room. The small balconies just outside each of these large windows are perfect for enjoying the magnificent views all around. This project would never have been possible without the hard work and resourcefulness of our Glenburn Tea Estate Manager and his team of local workers who transported everything to this very remote site with amazing results. Glenburn Tea Estate (Tourism Division) DLX Ltd.